This toddler thought she had struck sweet, chocolatey heaven. She was so wrong. Aww, bless. This tiny tot thought she hit the jackpot when she fell upon an object that smelt and looked like chocolate bliss. So one-year-old Kaitlyn did what was only natural. She dug in with all the gusto of a Bachie contestant trying to devour Richie. But it turned out that sweet-scented cocoa-coloured object only tasted like disappointment. It was just a cleverly designed eye shadow palette. B-u-m-m-e-r.
Lauren Rincon found her little niece covered in her makeup and posted now-viral images of her looking less than pleased. 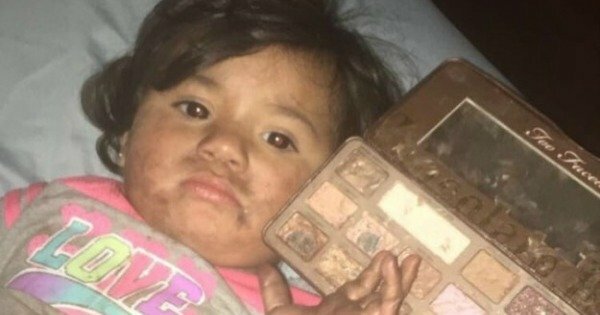 “My niece ate my Too Faced Chocolate Bar Palette because it smells like chocolate I don’t know if I should cry or laugh,” Rincon tweeted. Honey, we’ve all been there. Who hasn’t bought a lip balm that tastes like fairy floss and cherries only to proceed to eat the stuff off your lips all damn day? And I used to own a pair of shoes that smelt like strawberries. I definitely once snuck a lick just to check. Rincon later told BuzzFeed that she was mad when she first discovered what had become of her favourite eye shadow palette. But she tweeted that she managed to salvage it with “a million q-tips and napkins”. She also assured the concerned public that the eye shadow did not contain any ingredients harmful to Kaitlyn’s health.